So 'Hap' took the plans back across the pond, got General Electric on the horn, and said, "I've got these-here blueprints for a Whittle jet engine... build me a couple, would'ja please?" to which they replied, "How whittle is this engine?". *Ba-da-doo-chhh! * (more embellishment) Then he rang up Larry Bell in Buffalo and said, "I gots me some jet engines comin'... make me an airplane to put 'em in". And here's the result... the Bell XP-59A Airacomet. The whole show was supposed to be hush-hush... so, early on, to hide the true nature of this new bird whenever it was out in the open, a dummy prop was stuck on its nose and the forward half of the ship covered up with tarps to hide the intakes and exhausts. 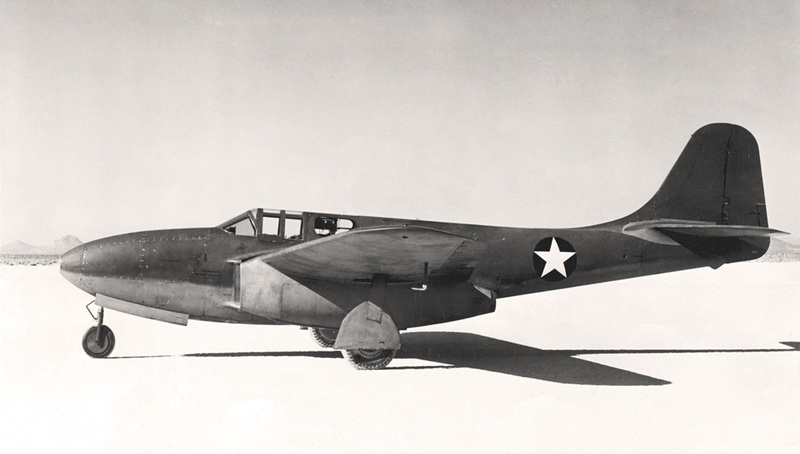 Also, as there was an earlier, slightly more conventional Bell project that was designated 'P-59'... one that never took off (pun intended)... the designation 'XP-59A' was chosen in order to make it look, on paper at least, as though this were simply a continuation of that earlier project. 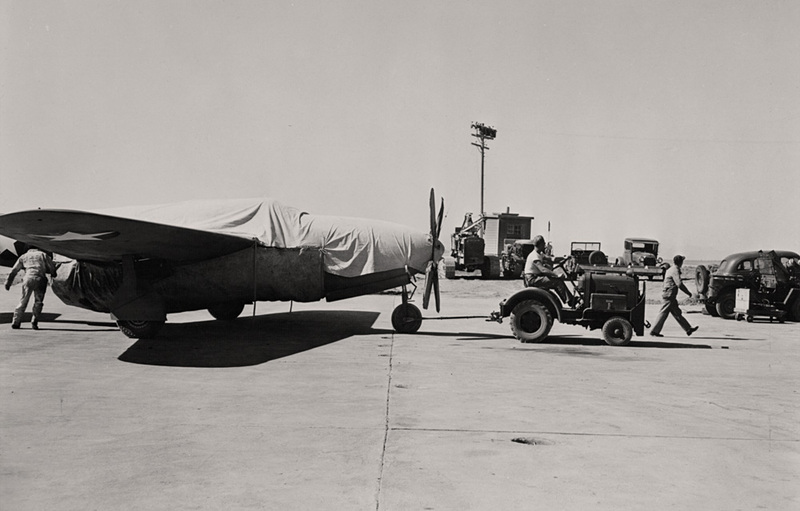 The XP-59A was shipped from Buffalo, NY by rail and truck out to Muroc Army Air Field, California... chosen for testing 'secret' aircraft chiefly because of its remote location within the Mojave Desert and because of its proximity to Rogers Dry Lake, which is one of the world's best natural runways. Also, Mother Nature provides excellent flying weather pretty much all year 'round. 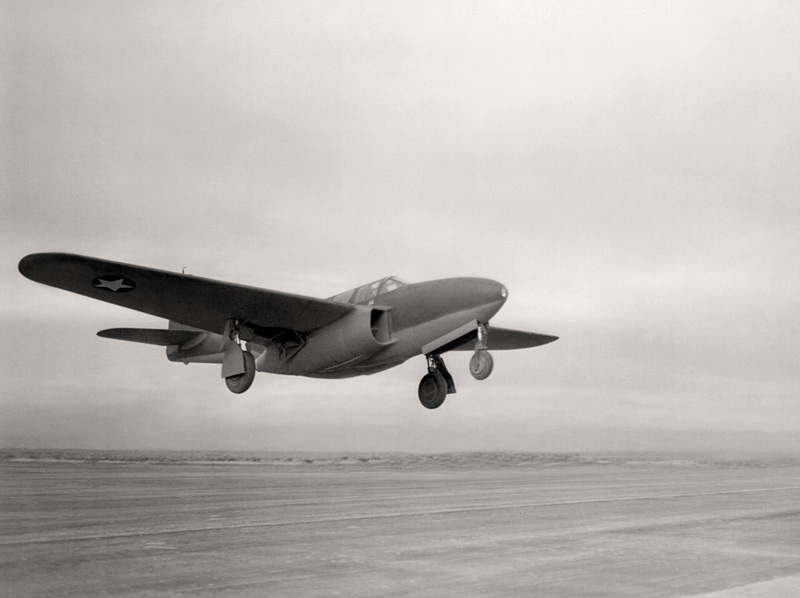 Anyhoo, on October 1st, 1942, while conducting high-speed taxi tests on the 'Lake', Bell test pilot Bob Stanley felt the XP-59A float up off the ground... and America's first jet aircraft made its first flight. The first 'official' flight took place the next day, with USAAF Colonel Laurence Craigie behind the stick. We'll present more on the Airacomet in future installments of 'Buffalo Wingz'.